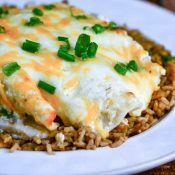 Cheesy Tomatillo Verde Sour Cream Chicken Enchiladas are cheesy, creamy, spicy, chicken enchiladas that are easy to make and your family will love. In a medium bowl, stir together the tomatillo verde salsa, sour cream, and half of the cheese. Stir in the shredded cooked chicken into the original batch of sauce. Add 2 tablespoons of the reserved sauce to the bottom of a 9-inch x 9-inch baking dish. Place roughly 1/4 cup of the chicken mixture in the center of each tortilla. Roll up each tortilla and place seam-side down in the baking dish. Pour the reserved sauce evenly over the top of the enchiladas. Sprinkle the remaining cheese evenly over the top of the enchiladas. Bake in a preheated oven for about 20 minutes until the sides are bubbly and the cheese is melted on the top. Garnish with chopped, green onions, cilantro, or chopped avocado and serve.